In a truly stunning discovery, science has proven our self-chosen capacity in observing what physically happens as we think and automatize our processes. The mind is not an independent entity within the body, but an organ of the body—its regulator and driver. But it too has a driver: our conscious will. There is heightened brain activity in certain locations, relative to the type and level of exertion required for any action we take. With brain imaging techniques, this activity can be monitored and linked directly to its causal factors. That portion of the brain actually expands to allow greater sensitivity to a chosen stimulus, enhancing the accuracy of our perceptions and our means to deal with them. When we apply consistent effort to a particular endeavor, connections in the brain are reinforced so that more neurons can be devoted to the task. The body builds stronger connections for the processes given preference by one’s consciousness. This doesn’t mean that if a man is a plumber, it advances the ‘plumbing’ part of his brain. The biological augmentation supports natural functions of human cognition such as creativity, motor skills, memory and specific sensory acumen, which span an unlimited array of practical applications. Just as the blind experience a heightening in their remaining senses, hearing for instance, and touch for reading Braille, we experience a heightening of our own design, based on our individual practices. A painter will experience increased activity in the frontal lobes and will develop strong connections between the visual cortex and the supplementary motor area controlling the minute skills necessary for delicate brush strokes. This physically tailored awareness is a proven phenomenon in all living entities. Why? Because their lives depend on their link to the environment—the flow of sensory data, and in the blind man’s case, the loss of one makes those remaining all the more crucial. For humans alone, our physio-intellectual structure adjusts to serve our own chosenpremises. It designs itself to serve whatever we choose as most important to pursue. If the wrong methods were learned, they can be overridden by sheer will, and the body will physiologically adapt to further its new instructions. Change your premises, and it will change you physiologically; it’s all up to you. That’s all for now, thanks for watching. Next up is how confidence replaces instinct for man. Click subscribe and leave a thumbs up if you’d like to help the world’s simplest moral philosophy based on nature itself expand to make the world a better place. 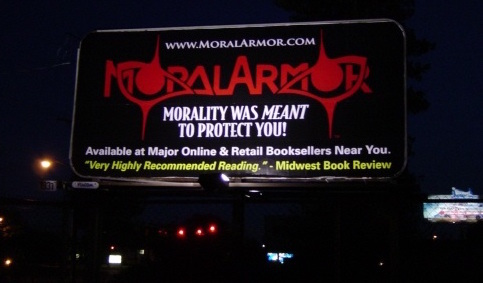 Below are links to Moral Armor and The Care and Feeding of Freedom, my latest book, on Amazon. Please leave comments or questions and I’ll be glad to answer anything wholesome and growth oriented. Thanks again, and see you next time.